After living on this earth for many years the new year doesn’t seem to mean much these days. Maybe because I feel like I am getting old. Every single year people make many resolutions, goals and so on but do they really accomplish them. I recently read a Forbes article that stated that 8% of people achieve their new years resolution, I wonder why? I really feel that is a low percentage I think it’s more like 60%. Here are some of the most common goals I hear time and time again. A. Emotions. Feelings of anxiety, depression – “if I am depressed I don’t feel like working out” and it’s ironic because once I exercise the feeling of depression goes away. D. Your goals are unspecific. We say “I want to get healthy this year” but when faced with the birthday parties in March, the overtime in June, and the family vacation in August, that goal falls by the wayside. E. They’re unrealistic. “I want to go the gym 5x/week.” Really? You averaged twice a month last year. Setting unrealistic, highly aspirational goals is a quick way to guilt and failure. F. They’re based on willpower. We say, “I want to walk more” instead of parking our car 10 minutes away. We say, “I want to stop messing around and go to sleep earlier” instead of testing different ways of falling asleep (like leaving our laptop in the other room, unplugging our TV, quietly covering our partner’s face with a pillow, etc). I am seriously tired of setting goals each year that I don’t complete. I can’t even remember what goals I had last year. So this year I am going to change it up a bit. I need a plan and a system. 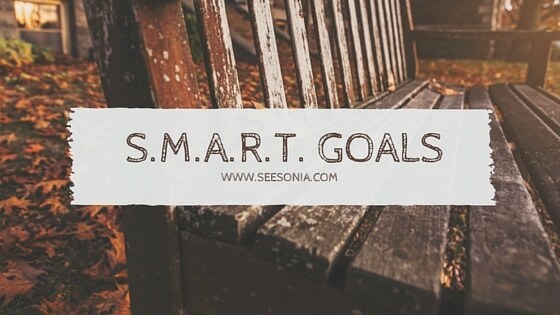 I found smart goals and an awesome app I am really starting to love. I was listening to a podcast about Accomplishing Goals: A Guide to Getting Stuff Done from the social media examiner and what John Lee Dumas was saying made sense to me. My goals for every new year have been to big and not measurable. He talks about writing smart goals this method of achieving your goals has been around for a long time, I just found out about it but it’s never to late, right? Time-bound: Goals should be linked to a timeframe that creates a practical sense of urgency. S– I’ll lose one pound a week by doing 45 minute cardio workouts, 4 times a week. I’ll also reduce my calorie intake by 250 calories by eliminating soda from my diet and replacing it with water. M– I’ll measure my progress by weighing myself at the same time of day on Monday mornings. I will use the same scale, wears the same clothes, and weighs at the same time of day in the morning, before breakfast to be more accurate. A– I’ll make this commitment to myself and for myself, knowing I can dedicate 45 minutes a day to cardio on Monday, Wednesday, Saturday, and Sunday. R– This goal is appropriate for my physical activity level, time availability, and commitment level. This goal also coincides with my larger goal to live a healthier lifestyle. T– April 30th, I’ll have lost 15 pounds and then I will be ready to set a new Smart goal. One other great tool I found to keep up to par with my goals is is an app called 30/30 it’s in the Itunes store. I am not sure if it’s available for android. My problem is always saying “I never have time“, this app is currently helping me write this blog. The 30/30’s interface is simple. The home screen is a clock representing the total amount of time it should take you to complete a set a tasks, and those tasks are listed below it. By clearly stating how long you want to spend on a project and leaving that timekeeping to an independent source adds just enough pressure to stick to your schedule. The urge to say, “Thirty minutes is loads of time” is quickly broken during your first sessions with the app; if you dawdle, it throws off your entire schedule, animating the consequences of sluggish work ethic. 30/30’s distraction-free interface lends itself well to this no-nonsense approach. Well my buzzer just went off see you on the next post! 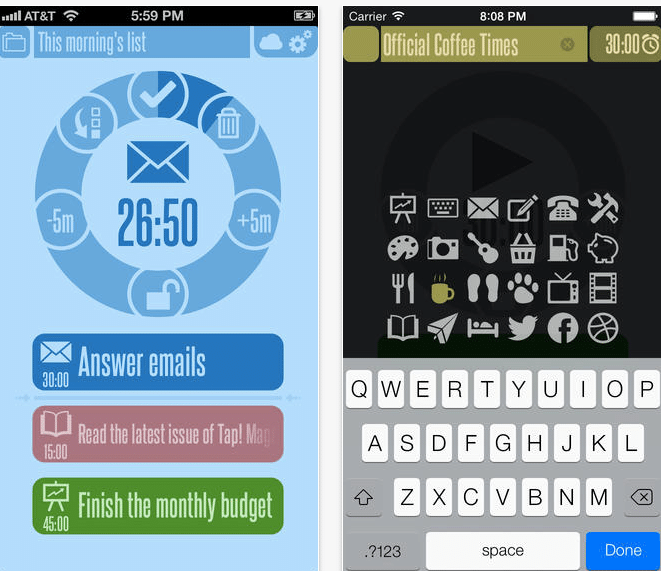 Screenshot of 30/30 app below.